When I was a girl I loved Valentine’s Day and I hated it too. I loved making my Valentines box and making Valentines for my friends. I loved our class parties and all the treats. I hated that I might not get a card from the boy I liked or some of my classmates. 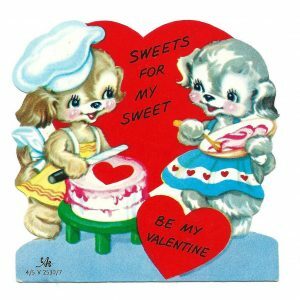 Here is what a valentine looked like in the 1950s when I was a girl. Many times, though I made my own valentines with lace doilies and red paper hearts. It was fun! I can still remember my favorite Valentine’s Day box. It was two large blue hearts with frilly edges glued together which made a pouch. I thought it was magnificent, but I remember that my teacher mentioned that she thought it ought to be red or pink or white. Hmmm. I was always doing something different. I guess I liked being creative. Do you know why Valentine’s Day is celebrated? The story of how St. Valentine’s Day came to be is a real mystery. Some say it comes from ancient Roman traditions and some say it has Christian origins. There are at least three men named Valentine that have been made Saints by the Catholic Church. One legend, and the one I like best, says that a wonderful, kind man named Valentine continued to marry young couples despite a law forbidding young men to marry. The emperor thought that single men made better soldiers. When Valentine’s actions were discovered, Emperor Claudius ordered that he be put to death. Another story says that Valentine sent the first “valentine” greeting himself. 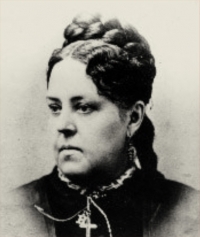 While in prison, it is believed that Valentine fell in love with a young girl — who may have been his jailor’s daughter — who visited him during his confinement. Before his death, he wrote her a letter, which he signed “From your Valentine”. 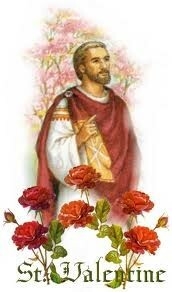 By the middle ages, which was a really long time ago, St. Valentine had become one of the most popular saints. I think it is because we all want a hero to look up to and we all like romantic stories! 1700s. 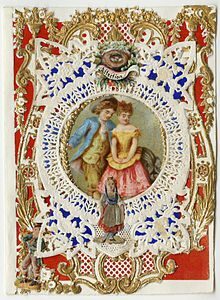 In the 1840s, Esther A. Howland began to sell the first mass-produced valentines in America and according to the Greeting Card Association, an estimated one billion valentine cards are sent each year, making Valentine’s Day the second largest card-sending holiday of the year. Can you guess which holiday comes in first? A day of love, like Valentine’s day, is celebrated in many other countries and in many different ways. Here are just a few that I know you are going to find interesting. In the county of Norfolk in England, a character called ‘Jack’ Valentine knocks on the rear door of houses leaving sweets and presents for children. In Finland Valentine’s Day is called Ystävänpäivä which translates into “Friend’s day”. As the name indicates, this day is more about remembering all your friends, not only your loved ones. In Romania, the traditional holiday for lovers is Dragobete, which is celebrated on February 24. In Slovenia, a proverb says that “St Valentine brings the keys of roots,” so on February 14, plants and flowers start to grow. Valentine’s Day has been celebrated as the day when the first work in the vineyards and in the fields starts. In Wales, many people celebrate St Dwynwen’s Day on January 25. Amistad” (Day of Love and Friendship); for example Mexico, Costa Rica, and Ecuador. Although it is like the United States’ version in many ways, it is also common to see people do “acts of appreciation” for their friends. In Brazil, the Dia dos Namorados (“Day of the Enamored”, or “Boyfriends’/Girlfriends’ Day”) is celebrated on June 12, when couples exchange gifts, chocolates, cards, and flower bouquets. In South Korea, women give chocolate to men on February 14, and men give non-chocolate candy to women on March 14 (White Day). On April 14 (Black Day), those who did not receive anything on the 14th of Feb or March go to a Chinese restaurant to eat black noodles and “mourn” their single life. In Japan, the romantic “date night” is celebrated on Christmas Eve. In Iran, the Esfandegan, is an age-old traditional celebration of love, friendship, and Earth. See if you can you find all of these places on a map? Even though we may not call it by the same name or even celebrate in the same way, everywhere people want to remember those they love and care about. Make a paper conversation heart wreath. You won’t need any help with this. 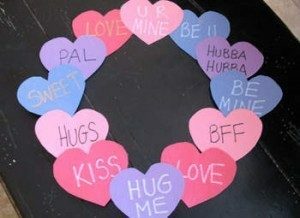 Just cut out some construction paper hearts and write your messages on them. Then glue them into a ring. 2. Download some valentine coloring pages HERE. 3. On this page, you can find all kinds of Valentine puzzles and games. Here is a fun idea for the family. 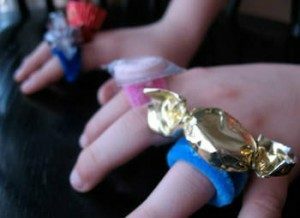 Make these Valentine rings and put one at each plate at dinner time. All you need are pipe cleaners, glue and wrapped candy. Wrap the pipe cleaner around your finger. Slide it off. Put a drop of glue on the top and add your candy. Let dry. Yum! * What did the bunny say to his girlfriend on Valentine’s Day? * What did the bear say to her boyfriend on Valentine’s Day? How many hearts are there in this picture? 51– 50 small hearts and add one for the whole big heart. What did the bunny say to his girlfriend on Valentine’s Day? Some bunny loves you. What did the bear say to her boyfriend on Valentine’s Day? I love you bear-y much.